Email us with your group’s actions, and we’ll add it to our list: contact us. Broadmeadows Magistrates Court, 19 Dimboola Rd, Broadmeadows. At the corner of Marsh and Dumaresq Streets in Armidale. at the traffic lights, on the river side of the intersection of Kerr and River St, Ballina. outside MP Kevin Hogan’s office, Molesworth Street, Lismore. Outside office of Cathy O’Toole MP, corner of Nathan Street and Ross River Road. Parliament house steps, North Terrace. #BringThemHere Weekly Vigil. Every Friday from 11:00 until 1:00. Tassie Nannas knit and interact with passers-by You don’t need to be a knitter (tuition, wool and needles are available) or a nanna to join us. Monthly – 5-6pm, first Friday of every month, Honk-a-thon. 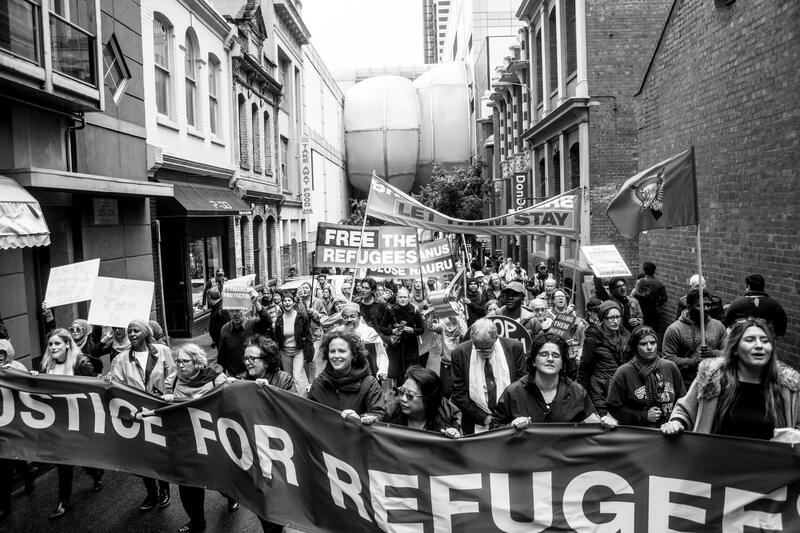 Hobart locals raise their voices and horns to highlight the Australian Federal Government’s human rights abuses towards people seeking asylum. Corner Murray and Macquarie streets, Hobart. Weekly – Mondays 11am to 12noon. Outside Catherine Kings Office. 5 Lydiard St. Nth. Ballarat. Monthly – 5.30pm – 6pm On the third Friday each month. Every Tuesday, 3.30pm – 4.30pm. Grandmothers Against Detention of Refugee Children weekly vigil. Cnr. Bell St. and Sydney Rd. Coburg. Fortnightly on Thursdays – Geelong. 12:00 – 1:00 pm. Silent Vigil, outside Myer, Lt Malop Street. 5.30pm – 6.30pm Every Friday. Outside Cathy McGowan’s office – 117 Murphy St. Wangaratta. Outside Dan Tehan’s office, 73 Kepler Street, Warrnambool. Contact Love Makes a Way for roster. A nationwide phone marathon to tell politicians that Australians want a complete amnesty for all the asylum seekers on Manus Island and Nauru. Call or email your local MP and the Senators for your state, between 9:00 am and 5:00 pm. 2pm 1st Saturday every month. Choose from 147 pre-planned locations in five capital cities across the country.